Welcome to our Military Families Blog. 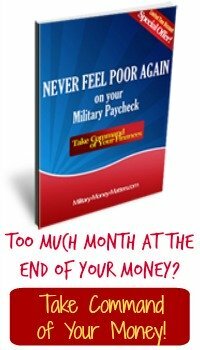 Here you'll find current items of interest to military families, including financial tips to help you deal with the money problems that are unfortunately all-too-common for military members and their families. We've provided two easy ways to be automatically notified whenever something new is posted. Subscribe to our RSS feed. It's easy, it's free, and it's anonymous. No need to give us your e-mail address, or any other information. Our new posts will delivered to your RSS reader if you click on the orange "RSS" button in the "box" on the right, and add us to your RSS reader. If you don't know RSS from Adam, click on "What's an RSS feed?" Subscribe to Military Families Blog by Email if you don't want to be bothered with checking a reader every day, and you'd prefer to receive our updates via e-mail. If you know of information that you believe should be added here, or if you would like to make comments regarding various entries, please feel free to send it to us using our contact form. Blog Archives. Some items will remain at the bottom of the blog page for more than a month. That's because they're important enough that we want new readers to find them without having to search through archives. Have you heard about and want to support the TV ad that Move America Forward is running this week to tell the anti-military folks in Berkeley, California, that "We're just not gonna take it any more!"? If you haven't yet seen the ad, you can do so by clicking on the Permalink below this entry - it will take you to a page on our site with the ad displayed. If you'd like to make a contribution to ensure this ad gets the widest distribution possible, you can contribute online here. Or you can contribute via PayPal here. Both links will take you to pages set up by Move America Forward to accept your contributions specifically for this ad campaign. 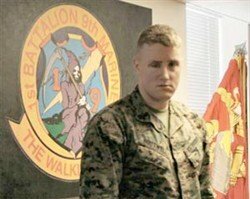 We need to support our Marines, and we need to let Berkeley and the rest of America know we won't allow any city in America to treat our Armed Forces in this way. Semper Fi means something! And we need to make sure those folks in Berkeley understand it. Please post your messages of support about Berkeley's anti-military stance. Here's an idea that will solve that problem for you. Seems this is not the first time consumers have boycotted businesses in Berkeley, CA, due to the bone-headed anti-war actions of its City Council (and probably won't be the last). "Berkeley has seen an economic backlash in the few days since the council approved a resolution calling for a stop to U.S. bombing in Afghanistan, with hundreds of people refusing to spend money in the city." A software company already reported losing a $60,000 contract because of the council's anti-war resolution, Dean said. Additionally, she said that a number of restaurants have seen their clientele drop." And some of the same members were on the Berkeley City Council THEN! It's definitely going to take some heavy economic damage to the City before the City Council understands it has a responsibility to ALL its citizens, not just the anti-war beatniks. Perhaps the businesses in Berkeley should sue the members of the City Council in their individual capacities for the losses to their business because of the illegal actions of the City Council (interfering with military recruitment is a federal offense). Write your Congressional representatives and Senators! Ask them to "Strip ALL federal money going to any entity in the City of Berkeley!" Although John McCain sometimes takes unpopular stands, he stands on his principles, and he doesn't back away just because his position is unpopular. Move America Forward is taking on the Berkeley City Council. On January 29, 2008, the City Council in Berkeley, California, voted to send a letter to the local Marine Officer Recruiting office, with a copy to the Commandant of the Marine Corps, suggesting that they retreat. Retreat? The United States Marine Corps? I don't think so! Actually, the letter called the Marines "uninvited and unwelcome intruders," and suggested that they close the recruiting office in downtown Berkeley. The City Council encouraged citizens to impede the recruiting activity at the center, and went so far as to grant Code Pink, a foul-mouthed anti-war group, a reserved parking spot directly in front of the recruiting office to facilitate their weekly protests. Dr. Sam Bierstock, of Del Ray Beach, Florida, and John Melnick, of Pompano Beach and a member of Bierstock's band, "Dr. Sam and the Managed Care Blues Band," have written a song inspired by an old soldier working as a parking lot attendant in an airport parking lot. The mournful "Before You Go" does more than salute those who fought in WWII. It encourages people to go out of their way to thank the aging warriors before they die. "If we had lost that particular war, our whole way of life would have been shot," says Bierstock, who plays harmonica. "The WW II soldiers are now dying at the rate of about 2,000 every day. I thought we needed to thank them." Click below to read the story and listen to the song. Is budgeting a dirty word at your house? Most of us think that we don't overspend (OK, maybe secretly we're afraid that we might), but we don't have a good handle on how much "discretionary spending" we actually do, because we're far too busy to keep track of every penny we spend. And that's precisely why, before we get to the end of the month, we find we've reached the end of our money! So, exactly how do we go about figuring out how we can spend less money? Marine Corps Sgt. Jeremy F. Boutwell, 23, knows a thing or two about honor, courage and commitment. An intelligence specialist serving with Headquarters and Service Company, 1st Battalion, 9th Marine Regiment, 2nd Marine Division, 2nd Marine Expeditionary Force, Boutwell is getting ready for an upcoming deployment to Iraq. He has spent the past four years recovering from severe injuries he suffered during a March 2004 attack in Iraq's Anbar province, and then fighting for the opportunity to go back. Click the link below to read his story. If you haven't been following the firestorm of publicity about the Berkeley City Council's actions to interfere with military recruiting, specifically by interfering with the local Marine Corps recruiting station, you can read the background here. If you have, you'll be interested in the response the Berkeley Chamber of Commerce sent to San Diego businessman Brian Dennard, who has vowed to start a widespread boycott of Berkeley businesses. The Berkeley Chamber of Commerce is asking that people not penalize the businesses of Berkeley. But, because the city derives tax revenue from Berkeley businesses, this is one way to hit the City in the pocketbook, and to get the business owners to exert some influence to demand that their City Council come to its senses. Federal and state lawmakers are proposing legislation that would strip Berkeley of federal and state funds. The City Council in Berkeley, California, recently voted to notify the US Marine Corps that its local recruiting office was an "uninvited and unwelcome intruder." It also encourages citizens, particularly the anti-war group Code Pink, to disrupt the recruiting and enlistment process, which is a violation of federal law. Read the full story and post your comments. "WASHINGTON, AP - John McCain effectively sealed the Republican presidential nomination on Thursday as chief rival Mitt Romney suspended his faltering campaign. 'I must now stand aside, for our party and our country,' Romney told conservatives. 'If I fight on in my campaign, all the way to the convention, I would forestall the launch of a national campaign and make it more likely that Senator Clinton or Obama would win. And in this time of war, I simply cannot let my campaign be a part of aiding a surrender to terror,' Romney told the Conservative Political Action Conference in Washington." By "suspending" his campaign, rather than "ending" it, Romney retains control of his delegates, as did Democratic candidate John Edwards. Tomorrow is Super Tuesday, the day for Presidential primaries in 24 states, nearly half the country. It's the closest thing to a dress-rehearsal for the national election. If you're still undecided, or if you're just curious, we have a link to an NPR survey you can take that will tell you which candidate's views align most closely with your own. And now's your chance to tell our readers which candidate you support and why. Click the link below, and tell our readers how you think they should vote tomorrow! What Will That Big-Screen TV Cost on Credit? With the Super Bowl coming up this weekend, and all the electronics stores running sales, we thought this a good time to remind you how much you'll pay for that big-screen HDTV if you buy it on credit. President Bush has signed the $696 billion defense bill, which makes a 3.5 percent military pay raise retroactive to Jan. 1. 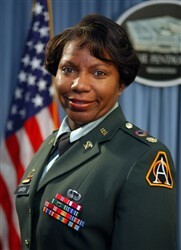 Army Maj. Lisa L. Carter, a two-time Iraq veteran, participates in Why We Serve because she wants to share her life's success story with the American public, hoping her story will inspire others. A few years after graduating from Fulton High School in Atlanta in 1984, Carter found herself a single mother working at a post office in Atlanta while caring for her 2-year-old daughter. Equal & a Better Choice. Folks in politics is just like a bowl of granola: Them what ain't fruits er nuts is just flakes! With the campaign season in full swing, we thought this might be a good time for a review of the restrictions on the political activities of US military service members. Some are based in federal law, others in military regulations. The main purpose for these restrictions is to avoid the implication/inference that you, as a military member, represent some official point of view. I have known John McCain for over 40 years. He was one of my flight instructors in the Navy before he was shot down and became a POW in Vietnam. We don't think anyone can deny the impact this year's Presidential Election will have on the future of this nation, and especially on its military families. The Global War on Terror is a major issue in this election campaign, and because of its impact on our audience of military families, we felt it appropriate to discuss the campaign here. You may disagree, and if so, please feel free to ignore our pages about the 2008 Presidential Election, a list of which you can find on our site map. On the other hand, if you'd like to participate in our discussion of the issues and the candidates, please voice your opinions. This will be an adult discussion, so if you're into flame-throwing, please don't bother. Your submissions will see the round file instead of the light of day. We'd like to encourage you, as members of the military, to express your views specifically about the War on Terror, and the volatile issue of when to bring the troops home. Should we begin an immediate pullout, as many suggest, or should we stay the course and complete the mission? You're in a better position than the rest of us to know if our efforts in Iraq and Afghanistan are being effective in stabilizing the regions there. Is this a worthwhile mission and should it continue, or should we come home and leave them to their own devices? We want to hear from our troops on the front lines, and their families. And we think the candidates should hear from you, too! Thanks for your service at Christmas time! As a vet who spent several Christmas holidays deployed, I know how tough it really is and truly appreciate the sacrifices you are making for us!